This comet emerged from behind the Sun in September 2006. Having arrived straight from the Oort cloud, Comet SWAN is making its first visit to the inner solar system. Due to its hyperbolic orbit it is set to leave into outer space and never to return. The name SWAN stands for Solar Wind ANisotropy experiment, which is carried aboard the SOHO spacecraft. 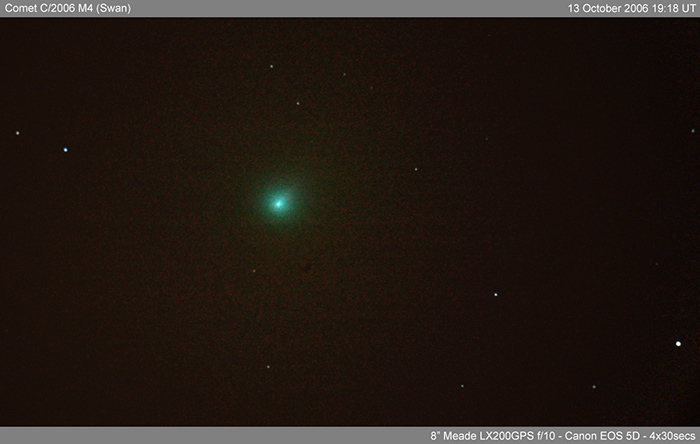 Light polluted London skies and field rotation prevented a longer exposure time - which would have revealed a significant comet tail. As many other comets, Comet SWAN is exhibiting a green glow; this is due to the cyanogen (CN) and diatomic carbon (C2) contained in the comet's coma - these substances glow green when illuminated by sunlight.